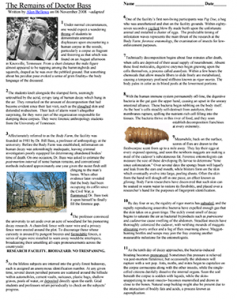 The article itself is about The Body Farm, a research facility in Tennessee where scientists study decay. Bodies are placed in a variety of circumstances so that researchers can observe decomposition. Students are exposed to the idea of skin sloughing, autolysis, bloating, and forensic entomology. The article is appropriate for older biology students or students in anatomy and physiology.